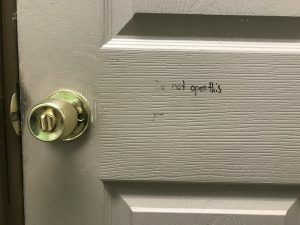 on the less-than-lovely bathroom door. Part of me wanted to listen. Touching the knob seemed like the very thing anyone in their right mind would choose to avoid. But I knew the only way out involved taking a risk. And I knew the message written beside the knob was not written with my best intentions in mind. In a gas station bathroom. I turned the knob and released myself from the confines of a space I had been in long enough. because sometimes God speaks through His Word and sometimes He speaks through gas station bathroom doors. And I knew He was speaking that day……………. long before I knew what He was trying to say. I began to understand the message. I was reminded of the miracle of Moses’ life. in an attempt to stop God’s plan. Bring an end to the salvation of the Israelite people. Put a stop to a Providential promise. Moses’ mother faced the first closed door. This was the command of Pharoah when he began to fear the growing number of Israelite people. There she sat, holding baby Moses in her arms. “Opening the door” meant risking her life to save her newborn son. Turning the knob was risky. she placed Moses in the Nile. and trusting her child to the God she loved. There was no way to know for sure. Miriam watched from the distance as her brother floated away. And another woman quickly entered the story. heard the cry of a baby and made her way to the basket. This is just too risky. But something caused her to reach for the knob…..
and walk into a chapter of life unlike any she’d ever walked in before. As he walked one day, he saw something that didn’t seem right. Moses found himself filled with anger. killing the Egyptian then hiding his body in the sand. 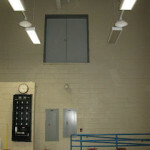 This door proved to be dangerous and sent Moses running for safety. Some doors lead to the wilderness. And Moses had opened one of them. marrying Zipporah and becoming the son-in-law of a priest. much less hear the voice of God coming from it. having an encounter with the Father of Abraham, Isaac, and Jacob. “I have heard the Israelites’ cry for help. as he stood at this door that would lead him back to the very place from which he had tried to escape? We stand at a door that for all practical purposes feels wrong. Reaching for the knob means things will never be the same. And the unknown life on the other side seems more frightening than the known life we are in. I’m sure part of him wanted to listen. the only way out involved taking a risk. And He knew the message written beside the knob was not written with his best intentions in mind. What door are you afraid to open today? right on the other side.